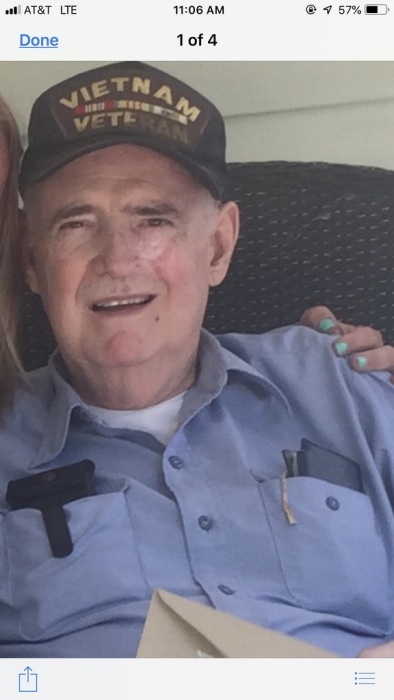 Michael E. Branham, 76, of Quincy went to be with the Lord November 22, 2018 after a courageous fight with ALS. Born October 31st, 1942 to the late Cecil and Molly (White) Branham. Michael married Debra Jayne Branham April 22nd, 1978 and she survives. Michael was an Army veteran who served in Vietnam, and he attended the Millgrove United Methodist Church. In addition to his wife he is survived by his daughters Julie Shuler and her husband Chad, Amy White and her husband Ronnie; grandchildren Austin Michael Bennington, Miranda Shuler, Madisyn Bennington; brothers Thomas Branham, Gregory Branham; sister Carol Larussa. Funeral services for Michael will be at 11:00 am Monday November 26th, 2018 at Whitaker Funeral Home. Visitation will be Sunday November 25th,2018 from 2:00 pm to 6:00 pm at the funeral home. In lieu of flowers, please make a donation to the ALS Foundation, or Wounded Warriors Foundation.